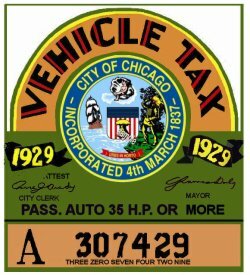 1929 Illinois Tax inspection CHICAGO - $25.00 : Bob Hoyts Classic Inspection Stickers, Add a Final Touch to your Restoration! This beautiful 1929 Illinois Chicago Tax and registration sticker. This reproduction sticker not only was for tax purposes but had to pass inspection also to get the sticker but certified that the car was on the road legally. This sticker will go on the inside passenger side of your windshield to identify it as a true classic vehicle. It has our patented "Peel and stick" format to adhere to your windshield, inside your car. This sticker can be custom ordered with your own classic license plate number for an additional $10.00 .